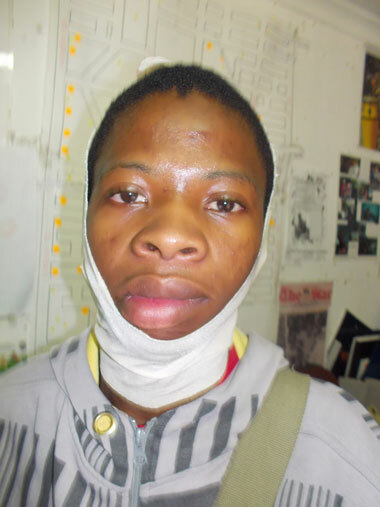 Franklin had a sorry-to-say useless pressure garment from Charlotte Maxeke Johannesburg Academic Hospital. It is white, makes him look like a nun, and does not fit. The purpose of a pressure garment is to put pressure onto the skin, to discourage scarring, particularly raised scarring. He needed silicon sheeting. The hospital had none in March 2013 and it had none in April 2013. The white colour is unsympathetic to a trendy young 19 year old male. Occupational therapists have to be realistic about what a young man will willingly wear around his friends and what he won't wear around anyone. 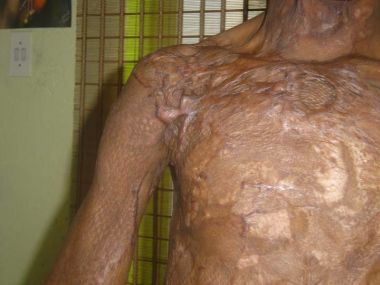 The Pelnac skin graft is not doing well with old Silicon sheeting only at night and a pressure garment (that exerts no pressure) only at night. In the private sector, occupational therapist Evanthia Pavli sewed Franklin a dark brown minimalist pressure garment that actually fitted, that exerts pressure and that is not a silly colour and a silly shape for a youth of 19 years old to be expected to wear. "I was born 20 October 1993. In the morning on the 13 January 2006, I was preparing water to wash and eat before going to school. I opened the five litre bottle of gel to put in the stove, so that I could heat water. I took matches to light the stove, the fire started immediately, exploding over the right side of my body and my face. I was taken to the clinic then transferred to Chris Hani Baragwanath Hospital because my injuries were severe. I was admitted to the burns unit for eight months; the first three months were in intensive care. While I was in hospital I received good care. I went to physiotherapists and I went through many operations. 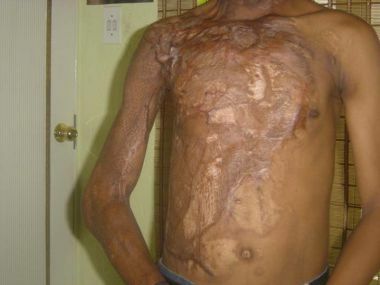 The skin graft on my chest did not take, so they had to redo it. But eventually it took and once it was healed, I was discharged. I returned as an outpatient for treatment and occupational therapy. 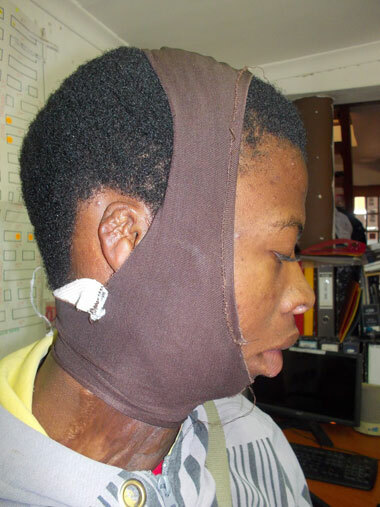 I was then re-admitted in the December holidays to try to remove keloids from my face. I was discharged just after Christmas. I'm now alive and like any other child. I would like to thank my doctors, nurses and everyone at the burns unit. And I would like to thank Children of Fire for helping me too." 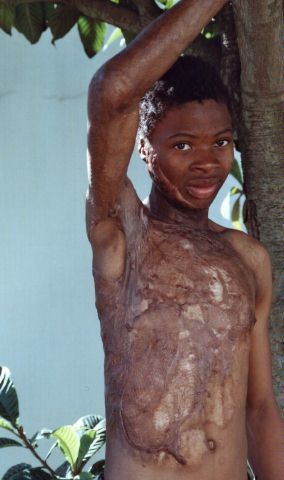 Franklin Mochadibane, a burns survivor from Soweto, thoroughly enjoyed his trip to Dragon Peaks in the Drakensberg with Children of Fire in 2008 and he climbed Mt Cameroon in Cameroon in the climb led by Tristan Jones in January 2011. 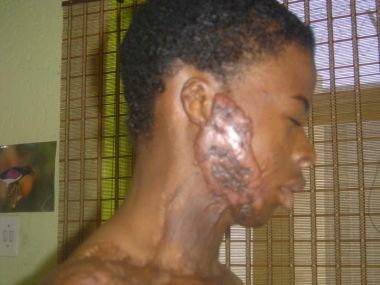 In 2012 Franklin asked for his facial keloids to be looked at again. Children of Fire flew him to Cape Town that November where he became a patient of Professor Don Hudson and Dr Shaun Moodley at Groote Schuur Hospital. With a porcine-based skin substitute, the side of Franklin's face was re-coated with donated Pelnac. Franklin said that the hospital was cleaner than those in Johannesburg - "there are no cockroaches there" - and the nurses were friendly. He had to lie in bed for three weeks, attached to a negative pressure machine which put pressure on the wound to make the Pelnac sit well. Volunteers like Bart Smit and a range of Cape Town Quaker friends went to visit him. Comair kindly flew Franklin to Cape Town for surgery and for a check up again in 2013. 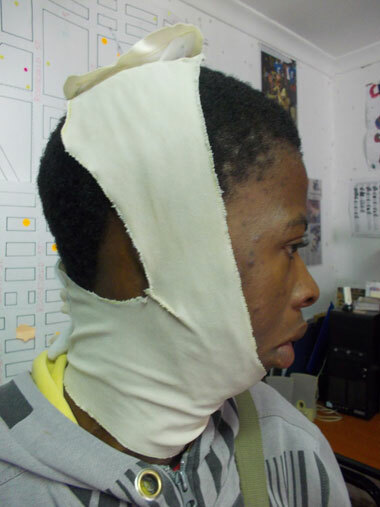 Evanthia Pavli, an occupational therapist in Johannesburg, sewed him two pressure garments. Franklin from Soweto, South Africa, attended the July 2008 Drakensberg Outreach. 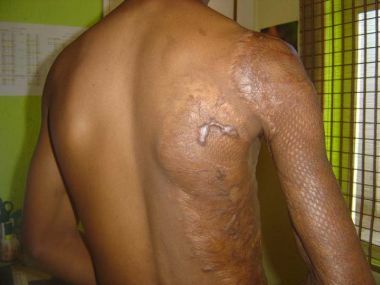 He was burned when a supposedly eco-friendly gel stove exploded.